The Huang family (portrayed, from left to right, by Hudson Yang, Constance Wu, Randall Park, Forrest Wheeler, and Ian Chen). With a little more than a week until Golden Globe nominations are announced, the cast of ABC's "Fresh Off the Boat" is making a final push for recognition with a new video and hashtag campaign: #makeitrightFOTB. 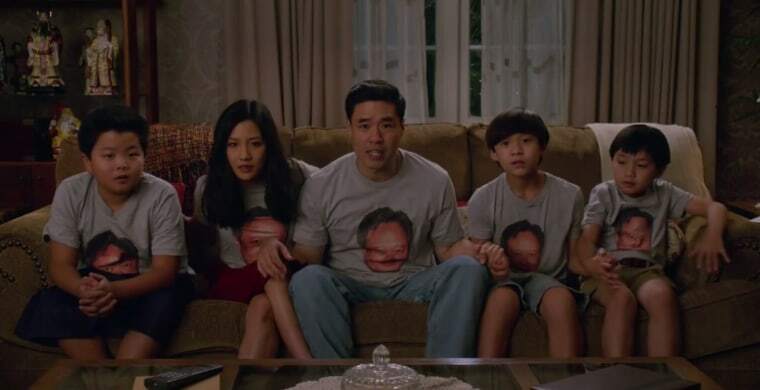 The video, set in 1996 like "Fresh Off the Boat," begins with the show's Huang family on the couch in matching T-shirts that feature Academy Award-winning director Ang Lee's face. Lee, in 1996, had been nominated for best director at the Golden Globes for "Sense & Sensibility." "A Taiwanese directing a movie about white women in old England," Jessica Huang, played by Constance Wu, says in the video. "See boys? Anything is possible if you study hard and become a lawyer." As the Huang family watches Lee lose to Mel Gibson, who won for "Braveheart," the family becomes visibly upset. "That movie is about a bunch of white people fighting over a patch of grass!" Jessica Huang shouts. The video ends in the style of a PSA, with text that reads: "The Huang family has not watched the Golden Globes since 1996. Give them a reason to come back by honoring them with a nomination," adding that "Ang Lee would want you to." "Fresh Off the Boat" stars Wu along with Randall Park as the family's patriarch Louis, and Hudson Yang as Eddie Huang. Wu has been nominated for a Critics' Choice Television Award and a Television Critics Association Award for her role in the show. When "Fresh Off the Boat" premiered on ABC in February 2015, it became the first network primetime show in 20 years to feature an Asian-American family. ABC recently ordered nine additional episodes of the show, bringing the total number of episodes for its second season from 13 to 22.